While Bangkok’s traffic is an annoyance, it’s a fairly predictable annoyance. Once you’re familiar with the morning and evening rush hour, specific roads to avoid and alternative transport options such as the BTS and MRT, you’ll be able to get around the city quickly and efficiently. Bangkok is a large, dense city without a clearly defined central business district. This means it can get extremely congested during the morning and evening rush hours, when workers based outside the city drive to and from work. Traffic is fairly heavy in Bangkok throughout the day, but it’s at its worst from 7:30 to 9:30 in the morning and 5 to 7:30 in the evening. Outside of these hours, traffic in central Bangkok is still fairly bad. However, big traffic jams are usually limited to a few roads and popular intersections. Rush hour in Bangkok affects both surface roads and expressways, meaning you’ll likely end up in traffic if you try to reach either of Bangkok’s airports during rush hour. If possible, it’s better to leave early and avoid the rush hour than risk getting caught in traffic on the way to the airport. Not all roads in Bangkok are congested, even during rush hour. For the most part, congestion in Bangkok is limited to a few large roads that run through densely populated parts of the city, with some spillover effect on nearby streets (usually small sois) and surrounding areas. 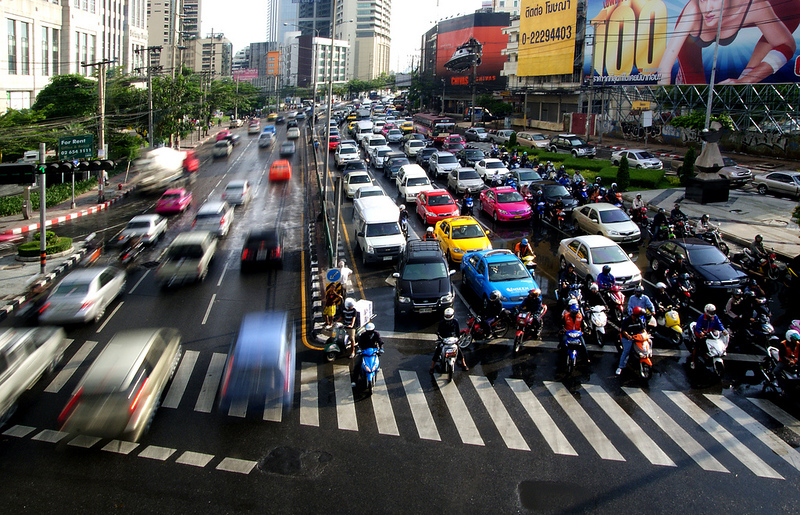 Sukhumvit Road, which is almost always congested during daytime hours and the early evening. Since most of Sukhumvit Road is covered by the BTS Skytrain, you will always save time by taking the BTS instead of catching a taxi. Petchaburi Road, which runs parallel to Sukhumvit Road several blocks north. Traffic on Petchaburi Road isn’t quite as bad as Sukhumvit, but it’s almost always crowded in the morning and evening rush hour. Rama IV Road, which connects Sukhumvit Road with the Silom/Sathorn business area, is perpetually congested during daytime. Since this area is served by the Silom Line of the BTS, you’ll always save time by taking the Skytrain. Silom Road is often the site of a slow traffic crawl, especially in the morning and early evening as people commute to and from work. As a major BTS/MRT interchange area, you can save a lot of time by travelling around the Silom area using the MRT. Sathorn Road, which is a short distance from Silom Road, is also a major traffic spot, especially during rush hour. Since it’s accessible by BTS and MRT, the easiest way to avoid the traffic is to use public transportation. The Ratchaprasong area is almost always jammed, even during the daytime. The best way to get around here is to use the BTS, which provides direct access to most of the malls in the area. Ratchadamnoen Road and other streets around Khao San Road can get seriously backed up with traffic in the morning and evening, making it easier to get to and from central Bangkok using the Saen Saep Express Boat. If you’re staying close to the BTS or MRT, use the train network to get around and avoid the traffic in Bangkok’s city centre. If you’re staying on Khao San Road, use the Saen Saep Express Boat to get to areas like Phayathai and Central Sukhumvit. If you’re staying around the Riverside, use the Chao Phraya Express Boat to get to the Grand Palace, Wat Pho and other attractions to avoid the traffic on Rattanakosin. Our guide to getting around Bangkok has more information on the fastest, easiest and cheapest ways to get around the city, ranging from motorcycle taxis to boats, taxis, tuk-tuks and more.